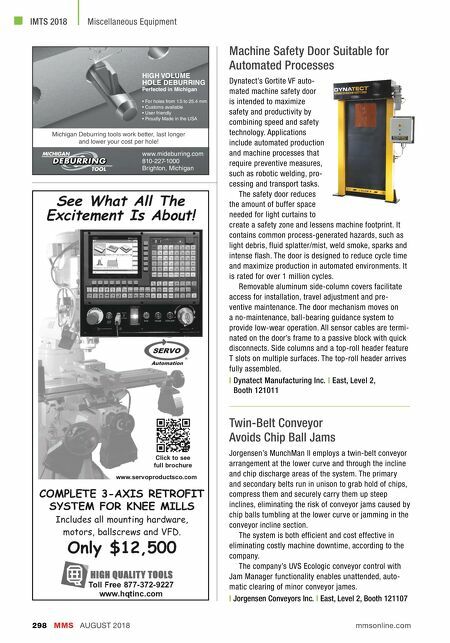 MMS AUGUST 2018 298 mmsonline.com IMTS 2018 Miscellaneous Equipment Twin-Belt Conveyor Avoids Chip Ball Jams Jorgensen's MunchMan II employs a twin-belt conveyor arrangement at the lower curve and through the incline and chip discharge areas of the system. The primary and secondary belts run in unison to grab hold of chips, compress them and securely carry them up steep inclines, eliminating the risk of conveyor jams caused by chip balls tumbling at the lower curve or jamming in the conveyor incline section. 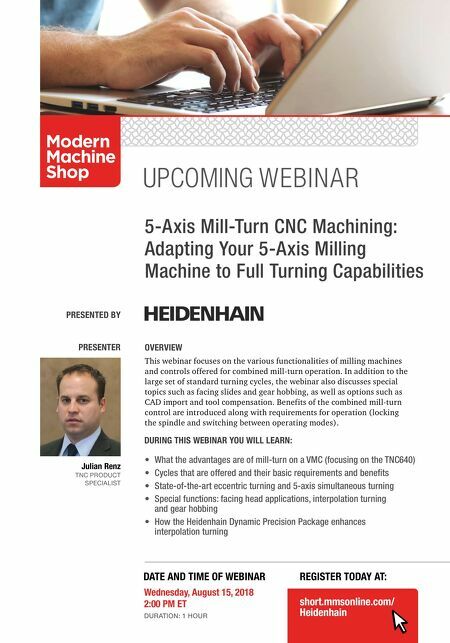 The system is both efficient and cost effective in eliminating costly machine downtime, according to the company. The company's UVS Ecologic conveyor control with Jam Manager functionality enables unattended, auto- matic clearing of minor conveyor james. | Jorgensen Conveyors Inc. | East, Level 2, Booth 121107 Machine Safety Door Suitable for Automated Processes Dynatect's Gortite VF auto- mated machine safety door is intended to maximize safety and productivity by combining speed and safety technology. Applications include automated production and machine processes that require preventive measures, such as robotic welding, pro- cessing and transport tasks. The safety door reduces the amount of buffer space needed for light curtains to create a safety zone and lessens machine footprint. It contains common process-generated hazards, such as light debris, fluid splatter/mist, weld smoke, sparks and intense flash. The door is designed to reduce cycle time and maximize production in automated environments. It is rated for over 1 million cycles. Removable aluminum side-column covers facilitate access for installation, travel adjustment and pre- ventive maintenance. The door mechanism moves on a no-maintenance, ball-bearing guidance system to provide low-wear operation. All sensor cables are termi- nated on the door's frame to a passive block with quick disconnects. Side columns and a top-roll header feature T slots on multiple surfaces. The top-roll header arrives fully assembled. | Dynatect Manufacturing Inc. | East, Level 2, Booth 121011 • For holes from 1.5 to 25.4 mm • Customs available • User friendly • Proudly Made in the USA Michigan Deburring tools work better, last longer and lower your cost per hole! www.mideburring.com 810-227-1000 Brighton, Michigan HIGH VOLUME HOLE DEBURRING Perfected in Michigan 1,, 1,, 1,, /""